Scholars have revealed that artwork and tons of pillars and winch barrels that were discovered by underwater archaeologist and researcher Can Pulak in 1993 close to the Aegean district of Çeşme originally came from Apollon Temple in Claros. 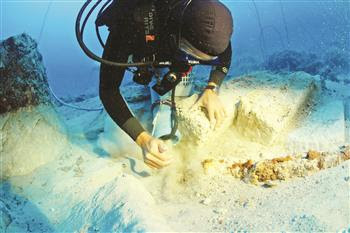 Five years of conservation work have revealed that the ship, known as the Kızılburun shipwreck, took its name from the ancient name of Marmara Island, “Prokenessos,” and sank during a storm in Kızılburun while carrying cargo to the Apollon Temple in the ancient city of Claros, according to Underwater Research Institute (INA) Director Tuba Ekmekçi. Half of the conservation of the works that were discovered have been completed, she said. Some 16 archaeologists from the United States, Europe and Turkey brought large marble winch barrels, capitals, anchors, marble gravestone, a Hermes statue and amphoras to the Underwater Archeology Museum in the southwestern district of Bodrum. The shipwreck was discovered during a dive by Pulak and was unearthed in 2005 as a result of work carried out by the Turkish Culture and Tourism Ministry, INA and Texas A&M University. Ekmekçi said they were waiting for permission from the ministry to exhibit the works.